Although the Senate confirmation of Supreme Court nominees is the most public part of the nomination process, the most critical phase - the initial selection of nominees - is usually hidden from view. 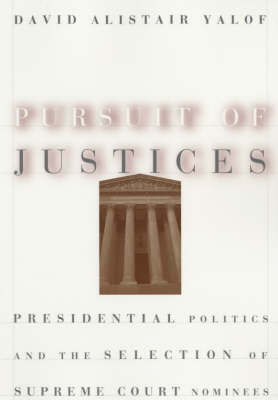 This book takes the reader behind the scenes of what happens before the Senate hearings to show how presidents go about deciding who will sit on the highest court in the land. David Yalof shows, an intricate web of forces - competing factions within the executive branch, organized interests and the president's close associates - all vie for influence during this phase of presidential decisionmaking. Yalof draws on the papers of seven presidents, from Truman to Reagan, and interviews with key figures, such as Ramsey Clark, Edwin Meese and President Gerald Ford. He documents and analyzes the selection criteria these presidents used, the pool of candidates from which they chose, their strategies and the political pressures affecting their decisions, both successes and failures. Yalof also disputes much conventional wisdom about the selection process, including the widely held view that presidents choose nominees primarily to influence future decisions of the high court. Yalof offers observations about the selections of Presidents George Bush and Bill Clinton in his epilogue. By focusing on a neglected area of presidential politics, Yalof offers a glimpse into the intricate world of executive branch decisionmaking and the Supreme Court appointment process as a whole.